JCI announced the Amazon SIM cards today. Regular and micro SIMs are available. 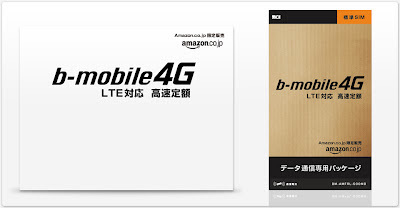 This is a monthly, recurring service that provides 500 MB of LTE 4G data for ¥1,980. An additional 500 MB charge may be purchased, but remaining data does not roll over to the next month. This is not for temporary visitors to Japan. Billing is recurring and address verification is required. 3G devices that support UMTS-2100 are compatible but will only get standard speeds. Compared to the 3G b-mobile FAIR, this will provide twice the data per month at a slightly less expensive rate. However, the initial cost of the SIM is ¥3,150, which does not include a charge. Data fees are paid separately to JCI. Data usage is subtracted from the monthly quota differently with the Amazon SIMs than with other B-mobile products. With the 3G Fair SIM, data usage is calculated by the byte. For the LTE chameleon SIM, data usage is calculated by the packet (128 bytes). With the amazon SIM, calculations are by the packet, but fractional usage is rounded up to 1 MB for the purpose of counting down the total 500 MB. It is unclear at what intervals this is done. That is, if 15.4 MB were used in a day, would a total of 16 MB be subtracted from the 500 MB. Or, if a 1.5 MB image is sent, is 2 MB immediately subtracted, with similar rounding happening throughout the day? I'd hope it's the former. To Purchase one of these SIMs, chose either the micro or normal size SIM from amazon.co.jp. (International shipping is not available, and this is not listed on amazon.com.) Once it arrives, register it online with b-mobile. Payment requires a credit card. A registration code will be sent to the billing address of the credit card. This code must be entered online within one month of starting service, or the SIM is deactivated. SIM card cannot be reactivated after canceling service. Data is counted in 1 MB increments. I was for the most part correct in my guess of what this product would be, though I didn't anticipate that there would be a large initial cost. Will this work i.e onto xi network with an ipad 3 early 2012 unlocked from UK? Cant get a straight answer out of bmobile - "maybe it will "
I just bought that SIM-card and filled out everything on their website. On the status page it says that I got 500MB left and that I should insert the registration code send via mail by next month or the SIM-card will be deactivated. Hi, thanks a lot for this helpful information. I would like to ask you if this SIM can be used for VoIP (Skype). Thanks in advance! We ship them anywhere in the world (free), which is a bonus as none of the providers in Japan ship outside Japan. NTT Docomo is unlikely to ever offer the iPhone.